In this lesson, we will learn how to estimate the area of some irregular polygons using a grid of unit squares. Find the area of the quadrilateral giving the answer to the nearest square unit. Bassem made this sign for his yard sale; find its area. The side length of each small square in the grid is one unit. Find the area of the colored shape. If the area of each small □ is 1, what is the area of the shape below? Fill in the blanks in the following: The area of the given figure = . In the diagram each square represents 10 square centimetres. What is the area of the colored shape? Find the area of the coloured shape by counting square units. How many different rectangles could you make with these 10 square unit tiles? Make sure that your rectangles use all the squares with no gaps and no overlaps. Suppose each square in the shown grid is a square centimetres. What is the area of the colored shape? Each square is 1 square unit. Each half-square is 1 2 a square unit. Find the area of the shape. Adel wants to fill his flower bed with new plants. Each plant needs one square unit of space. How many flowers should he buy? 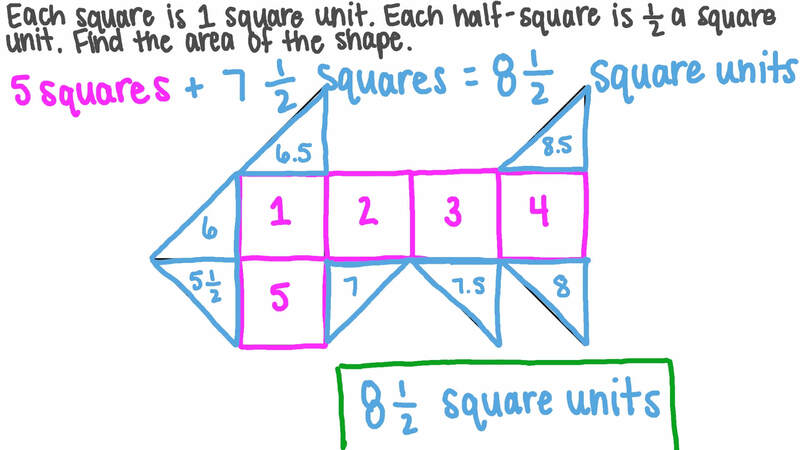 Remember to make an estimate by adding the smaller parts to make whole square units. Amir wants to tile a section of his kitchen wall above his cooker, as seen in the given figure. The wall is rectangular with a width of 2 feet and a length of 6 feet. The tiles Amir chooses are 4-inch-by-6-inch rectangles and are sold in boxes of 10. What is the minimum number of boxes that he will need to buy? If the area of each △ is 1, what is the area of the shape below? If the area of each is 1, what is the area of the shape below? In the given diagram, one square represents 5. Find the area of the shaded part. If the area of each △ is 1, what is the area of this shape? Each flower in Amira’s window box needs 1 square unit of space to grow. How many flowers will fill in the window box? This is a photograph of Maged’s new house. He needs to know the area of the roof to fit solar panels. Should he count the tiles to find the area? A No, because they overlap and cover more than the area of the shape. B No, because the square units do not cover the whole area. C Yes, because the area can be found by counting tiles. D Yes, because the tiles cover the whole area. E Yes, because the tiles do not overlap. The area of the given shape is . The area of the figure below = . 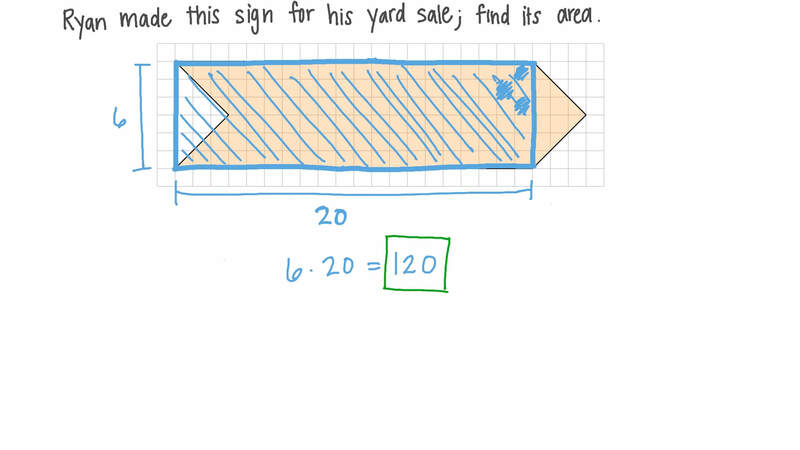 Use skip counting to find the area. Suppose each square in the shown grid is a square centimetres. What is the area of the coloured shape? Find the area of the blue shape. Remember that the area of each square is 1.